Aquaman is dedicated to making a great product and we stand behind our triathlon wetsuits. If you have a suit with a broken zipper or separating seams, this is considered a manufacturing defect. 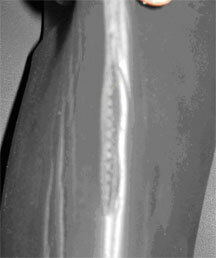 Aquaman will repair or replace your wetsuit within two years of purchase for a seam defect, and within one year for a zipper defect. The seams are the part of the wetsuits that are glued together. If the wetsuit is coming apart not at a seam, but due to a cut made by a sharp object (most of the time fingernails), Aquaman can’t be responsible. We will fix the wetsuit but the customer will have to pay the cost of repair and shipping. Alternatively, read our wetsuit repair page to learn how to make the fix yourself for much less cost and downtime. The warranty is only valid for manufacturing defects, and does not cover natural wear and tear to the wetsuit. Please call your store or Aquaman office at (269) 358-4856 if you have any questions. Continue reading below to see examples of what is and is not covered by our warranty. The picture below shows a seam that has come apart. This is considered a manufacturing defect, and within two years of purchase, is under warranty. 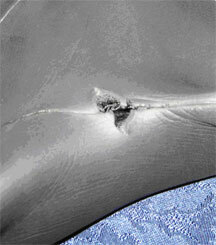 The following two pictures show punctures made on seams of the neoprene. 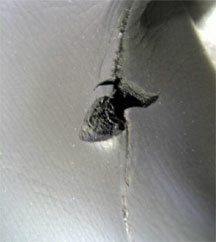 Although the damage is on a seam, the large hole indicates it was made by a sharp object, and the wetsuit damage is not considered a manufacturing defect. This type of damage is not under warranty. If your wetsuit damage looks more like the first picture, and not like the second and third pictures, please contact us for further instructions. If you need to return your wetsuit, please check our wetsuit return policy first. We’re sad if your wetsuit is damaged, but we do have more to choose from if you’re committed to triathlon. Click the button below to shop now.